When I got pregnant it seemed so unreal to me. It seemed that nine months would take forever. Now, here I am at 35 weeks with just five more to go! I am more excited than ever about my baby boy. And now the preparations for him to join us have begun in earnest. I’ve been washing baby clothes and blankets and putting them in the drawer. I’ve been gathering diapers and all the other things that I will need to care for him. 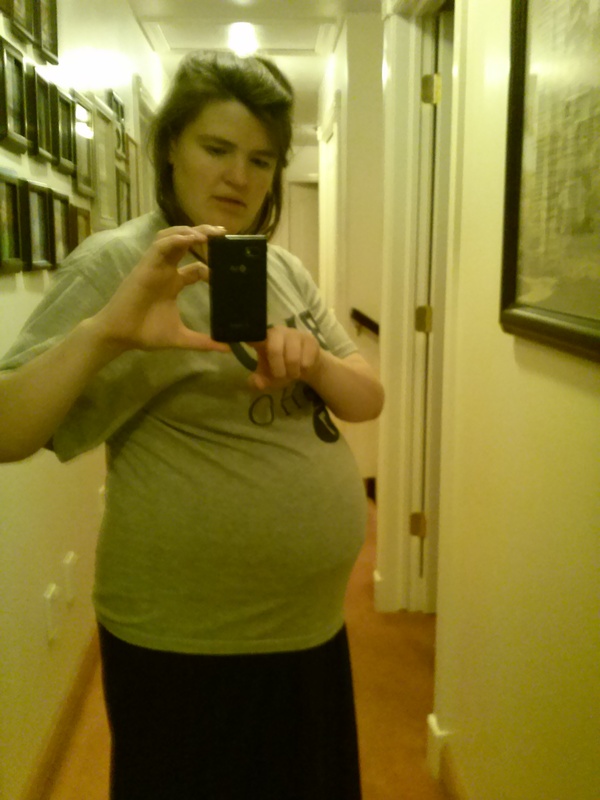 Mom wearing Daddy’s BYU shirt at 35 weeks. I’ve been preparing myself mentally and physically for the birth. And I’ve got to admit…I am almost as excited about the experience of birth as I am for the experience of having a baby. Call me crazy but I have been reading, watching videos and learning about everything childbirth related for a very long time. It’s made actually getting to experience pregnancy so much fun. So here are a few things that surprised me. 1.) The term carrying a baby is a bit misleading. I kind of always imagined carrying a little baby around in my belly for nine months waiting for the day it would be born….NOT THE CASE. Your body is working hard, and you feel it! It’s not “carrying a baby” It’s creating a human. Its growing organs, bones, skin, developing brains, lungs and all kinds of abilities. It’s sustaining a heart beat, a digestive system, its providing blood, regulating temperature and a million other things. Your body literally becomes a factory! And its the most amazing thing ever! 2.) I had no idea how much work there was in preparing the body for delivery. I kind of thought that when it came time to have the baby that’s when the work began. I had no idea that bones are softening and moving, that ligaments are stretching, squeezing and accommodating, Every part of your body begins preparing for the delivery almost as soon as you get pregnant and you feel that too! 3.) I knew I would be excited and happy to be pregnant. I had no idea it would be so fulfilling, bring so much peace and contentment, that love would grow so quickly and not just for my baby. That the spirit of the baby would be so present and so real and that nothing in this world would be as important to me as he is. Another thing I have been doing to prepare for this baby is baby showers! I honestly didn’t expect them to be this much fun. I’ve always felt a bit awkward and uncomfortable receiving gifts and having a party specifically for me. But this was actually kind of fun. One of the things that I enjoyed the most was a little activity that my sister Hannah put together for the shower. Each person was given a piece of paper shaped like a onesie to write some advice for me as the mom. Everyone wrote wonderful things, but here are a few of my favorites. From my sister Hannah here are just five of her ten pieces of really good advice. 1.) Don’t make me change his dirty diapers. I offer 3 times a week, that’s all. 2.) Keep some spare diapers, not for him, but for you because after kids, bladders just aren’t the same. 3.) stock up on chocolate 4.) Raise him with a musical background 5.) Don’t worry. He’ll be an awesome kid. From a dear friend…When you want to cry, do it. remember you were meant to do this, so when you don’t know what to do, pray. It is His child too and He wants you to succeed. From a sister that I have always looked up to…See the world through your child’s eyes, don’t expect to be a perfect parent. From a loving mother, Always be a friend to Preston and listen to what he has to say, most of all enjoy him and give him lots of love. From a sister with a 2 year old…If you don’t have a lot of patience you will learn to have it. From a sister without any children, but who still gives really good advice. Remember Netflix can wait. From Preston’s (biological grandma, not that it matters) Love Preston enough to have the courage to do what is best for him instead of what is easiest for you. and last but not least from a niece whom I love like a daughter…Remember to do the same things you did with me. So pretty much love that baby as much as you love me! I hope you love: hugs, your parents, your life, music, sleep, God above all else, safari animals, deeply, and unconditionally. I hope you become: A strong man, a dreamer, confident and successful, a handsome dude, firm in your faith, and a big brother. I hope you don’t: keep your mom awake all night (keeping my fingers crossed for this one! ), give up when trials come, ever forget that I love you, forget to pray, run from failure, experience prejudice, feel hopeless, get left at the store, cry a lot, sell yourself short. The list goes on with many beautiful and sometimes funny sentiments. It will be something fun to leave for Preston when he grows up. This entry was posted in Children, Family, Inspiration, Motherhood and tagged advice, baby showers, hopes and dreams, new baby, preparation. So excited for you, Vilate!